Beautiful Mexican passport with three passport pictures issued by the Mexican embassy in New York in 1917. Entries on back including visa USA. 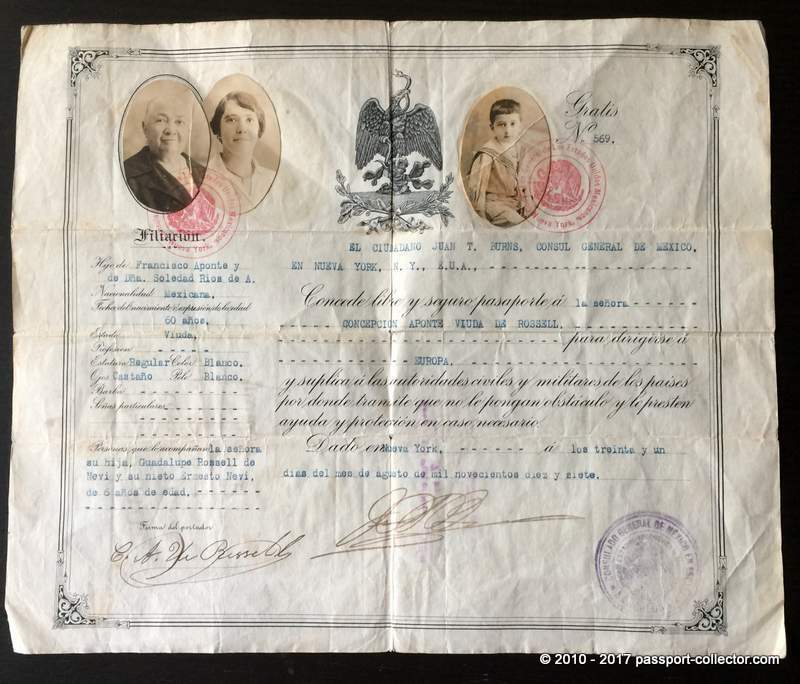 Such old Mexican passports are nowadays truly hard to find. I do have another one which is from 1941 issued to a beautiful woman. The passport is not traveled and comes hence in a pristine condition, which is outstanding for a 77 years old travel document. Since 2010, all Mexican passports are biometric. All passport applicants must have their pictures taken digitally; all ten fingerprints are taken and an iris scan is done: Although Mexican passports are biometric, they do not contain a data chip. But who wants a biometric when you can have such a beauty in your collection. Travel documents telling the stories of its bearers. Who were they? What did they work? Why did they traveled to China, India or USA in 1924 or in mid-19th century or 200 years ago? Where was the passport issued and from whom? Of course, there are many more questions to ask on geographical and political issues…it`s much more than just collecting it`s also an advanced research on travel documents. Today our passports are uniform but look at an old passport back in 19th century – at that time they were really some kind of “Art” and unique. Handwritten on nice paper with colorful stamps, signatures and beautiful photographs.